Meet Marilyn Buse, who has been teaching Spanish to our Kindergarten through 8th graders at St. John’s Episcopal School for six years. Senora Buse, who is originally from Long Island, New York, came to D.C. to attend Georgetown University and never left (lucky for us)! She received her B.S. in Spanish and French with a Linguistics minor at Georgetown. Senora Buse is not only a member of the St. John’s faculty, but she is also a alumni parent; her daughter Katie is a St. John’s graduate of the class of 2011 and is a freshman at American University. 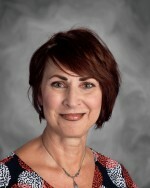 Senora Buse lives in Rockville, where she likes to take Bachata lessons, explore area hiking trails, and eat out at all the great Ethnic restaurants around D.C. A fun fact about her is that her dad was a Captain for American Airlines, so their family got to fly 1st class to a lot of really cool places. The 747 was her home away from home. Her favorite Mexican food is from Villa Maya, her favorite artist is Frida Kahlo, and her favorite pop singer is Enrique Iglesias. If she could travel anywhere in the world, it would be to Cuba’s dazzling, white, gold, and black, sugar-sand beaches. Senor Buse’s greatest wish for her students is that they will travel to breath-taking, exotic destinations, where they can Speak Spanish all day long. She hopes that they soak up the art, food, and culture of the vibrant, Spanish-speaking people and enjoy making friendships that last a lifetime.